Stumbled upon a very interesting post on JR, an undercover photographer who transforms his pictures into posters and makes open space photo galleries on the streets. 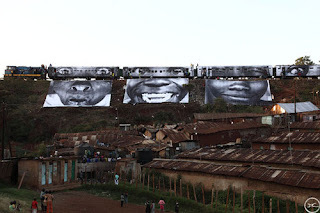 His projects are documented and known by collectors as "28 millimeters," consisting of several mini projects such as Project in Women in Kibera. Kibera is located in Kenya and is one of the largest slums in Africa. His work always shows a different perspective, mostly relating to human interactions or lifestyle. 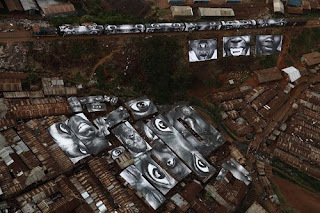 In the Kibera project, he takes on exhibiting and viewing in from the top and the images are amazing. His noteworthy artwork is well known and have been exhibited in museums such as Tate Modern, Centre Pompidou, and the famous 11 Spring in Soho, New York.